Nothing surpasses the unique appearance and beauty of Natural Stone. It is a stunning product of the earth. It’s attractive qualities blended with your personal style creates a timeless look with brilliance and classiness that only Natural Stone can provide. It creates an ambience and special effect of areas within a project. It can define and separate activity areas while adding beauty to its other natural attributes, making it suitable for imaginable projects both in Residential and Commercial. California Crafted Marble’s State-of-the-Art facility is fully equipped to handle a range of projects from the individual homeowner to large multi-family, commercial, and residential projects. Linac natural marble veining carefully lined up from top to sides of kitchen island to give it a smooth transition. We work with our customers to turn their project into reality by taking pride when lining up veining properly and making the seams as unnoticeable as possible. Natural Stone has an elegance about it, and should be installed in ways to manifest the senses of the mind. NOTE: It is not always possible to get an exact line up of the veining of Natural Stone due to various circumstances. 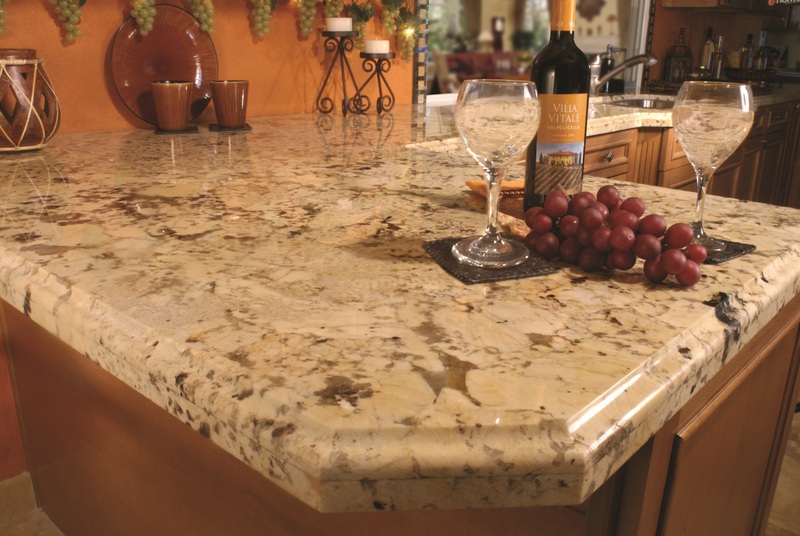 There are numerous options for Natural Stone that we offer for all of your counter top needs, which includes Granite, Marble, Quartzite, and Travertine. 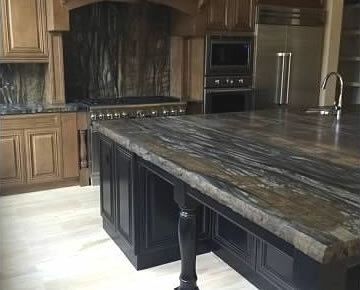 Granite is an igneous rock, which means that it has crystallized and solidified from a hot liquid, similar to lava, that is formed from the melting of different types of rocks, mostly comprised of quartz and feldspar. 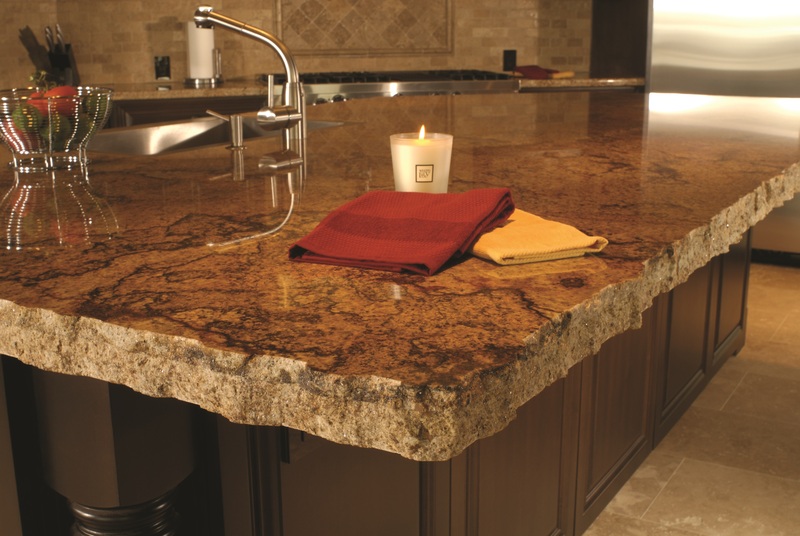 Granite slabs are sliced into sheets from the earth’s surface which introduces the pattern throughout each slab. If the pattern is consistent, it has a sense of flow or continuity. If the pattern is variegated with veining or movement, it highlights its one-of-a-kind grandeur. It’s reputation as a high-end material expands its horizon to more than just kitchens. Quartzite (not to be confused with “Quartz”) is a very hard metamorphic rock that has been formed from sandstone. A metamorphic rock is one that has been altered by energy that can include pressure and heat. Quartzite takes on the personality of natural marble and granite; whereas the veins look like marble and vary from slab to slab, yet acts like granite in durability and strength. Though you usually see quartzite in neutral colors, you can find slabs that have some incredible patterns and colors that show off a decorative display of beauty. 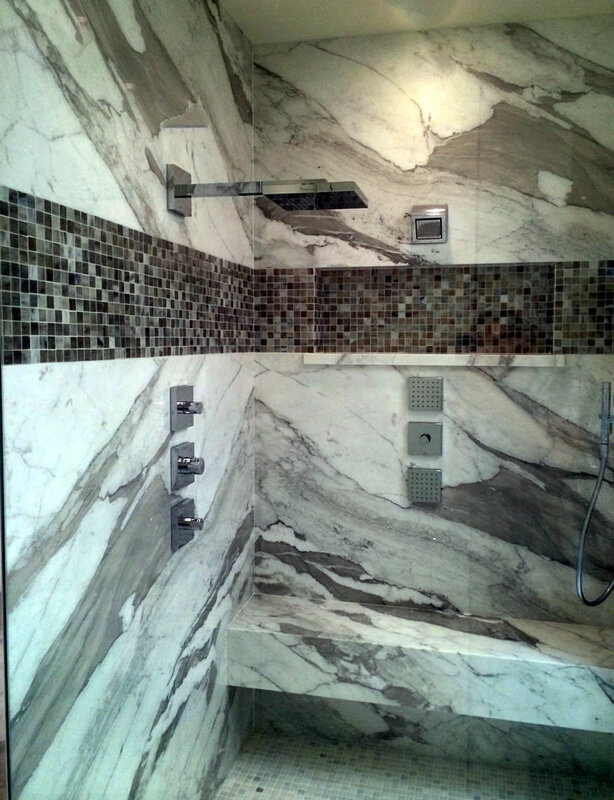 LEFT IMAGE: Natural marble shower with seating bench and tile accents. Matching dbl sink/multi-level vanity not shown. Marble is also a rock of this type that has been formed from limestone. 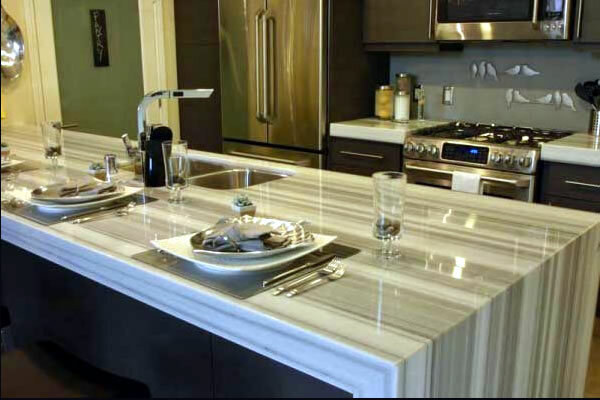 Marble is softer and more porous than granite and is susceptible to etching and staining by many foods, spilled liquids, and other household materials. Therefore, it is more suitable for fireplace surrounds and bathrooms. It really shows off its timeless elegance on almost every surface in the bathroom, including vanities, shower walls, and tub decks. Travertine is a terrestrial sedimentary rock. It is a form of limestone deposited by underground mineral springs, especially hot springs. It is considered the “middle stage” of limestone evolving into marble. Its concentric appearance exists in white, tan, cream-colored, and even rusty variations. Its subtle elegance with beautiful variations lends it with a captivating charm with its natural visual appeal, from plain and simple to refined. Come visit our Showroom in Santee, California.